Beetroot is one of my favorite vegetables so it’s kind of surprising I don’t have that I don’t have that many recipes for beetroot on this blog. I’ve just come back from a week away and I ate two outstanding beetroot dishes in my travels. A beetroot risotto from my favourite cafe in Wagga Wagga, Mates Gully and a potato and beetroot roesti with pickled beetroot in Melbourne. It reminded me that despite my lifelong love of beetroot I don’t often expand my beetroot repertoire. After a long hot summer and with the cooler weather, beetroot has just back into its own and I’m determined to make the most of this season. This recipe comes from one of my favorite new food writers Meera Sodha, a British Indian from Lancanshire. I love Indian food but Sodha’s recipes are really my kind of Indian food – simple home-style cooking that’s fresh, vibrantly colourful and uses readily available ingredients. 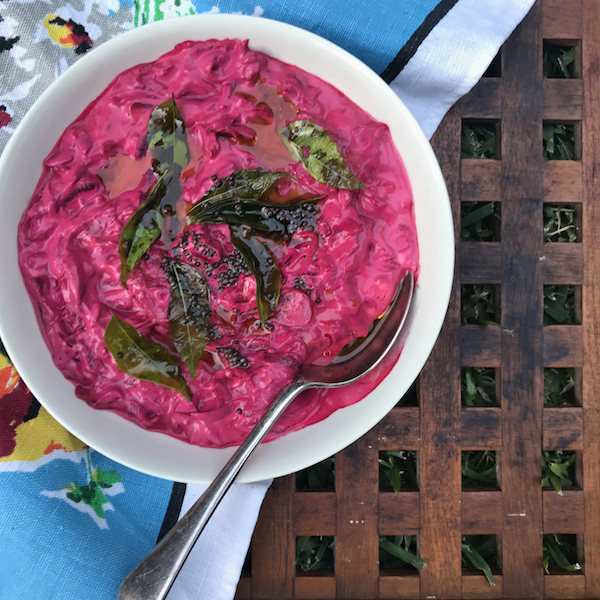 Some might find the hot pink, luridness of this raita disconcerting but that is precisely why I love it. Heat 1 tablespoon of oil in a small (20cm) frying pan over a medium heat. When hot add the garlic and cook until light golden, then add beetroot. Stir fry until beetroot is softens. (About 3 minutes). Palce yogurt, lemon juice, salt in a bowl, add beetroot and mix well. Make the taka – Put tablespoon of oil into the pan. Add curry leaves if using, let them sizzle for a few seconds then add mustard seeds and wait until they pop and curry leaves are translucent pour over raita. Serve as is and stir taka in at the table.